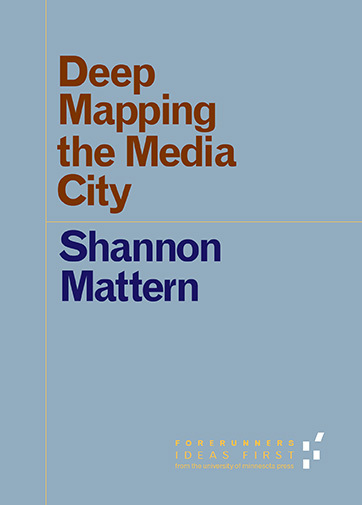 My New Book, Deep Mapping the Media City, Is Out! I’ve published a little book, Deep Mapping the Media City, with the University of Minnesota Press’s Forerunners series. It’s now available for purchase in print and as an ebook. 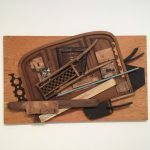 Written between fresh ideas and finished books, Forerunners draws on scholarly work initiated in blog space, social media, conference plenaries, and articles. We think of it as gray literature publishing: where intense thinking, change, and speculation happen in scholarship. This particular text originally took form as my keynote lecture for the 2013 “Media City” symposium at the Helsinki Collegium for Advanced Studies; and it draws on material I published in my “Ear to the Wire: Listening to Historic Urban Infrastructures” article, which appeared in Amodern in 2013; and my “Deep Time of Media Infrastructure” chapter, forthcoming in Lisa Parks and Nicole Starosielski’s Signal Traffic: Critical Studies of Media Infrastructures in May 2015. This Forerunner is intended to foreshadow (and to motivate me to finish!!) my longer book on Urban Media Archaeology.